Couple, Moment of a couple, Characteristics of couple, Moment of a force, Equivalent force - Couple system; Numerical problems on moment of forces and couples, on equivalent force - couple system. Definitions – Displacement – Average velocity – Instantaneous velocity – Speed – Acceleration - Average acceleration – Variable acceleration – Acceleration due to gravity – Newton’s Laws of Motion. Curvilinear Motion – Super elevation – ProjectileMotion – Relative motion – Numerical problems. 1. 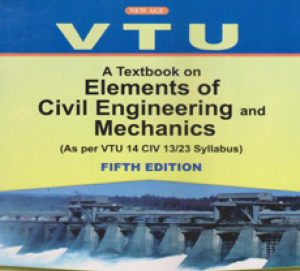 Know basics of Civil Engineering, its scope of study, knowledge about Roads, Bridges and Dams; 2. Comprehend the action of Forces, Moments and other loads on systems of rigid bodies; 3. Compute the reactive forces and the effects that develop as a result of the external loads; 4. Locate the Centroid and compute the Moment of Inertia of regular crosssections. 5. Express the relationship between the motion of bodies and 6. Equipped to pursue studies in allied courses in Mechanics. • 10 Questions are to be set such that 2 questions are selected from each module. • 2 Questions are to be set under respective modules. • Intra module questions are to be set such that the questions should cover the entire module and further, should be answerable for the set marks. • Each question should be set for 16 marks (Preferably 8 marks each) • Not more than 3 sub questions are to be set under any main question • Students should answer 5 full questions selecting at least 1 from each module. Education Private Ltd, New Delhi, 2009.
International Publisher, New Delhi, 3rd edition 2009.